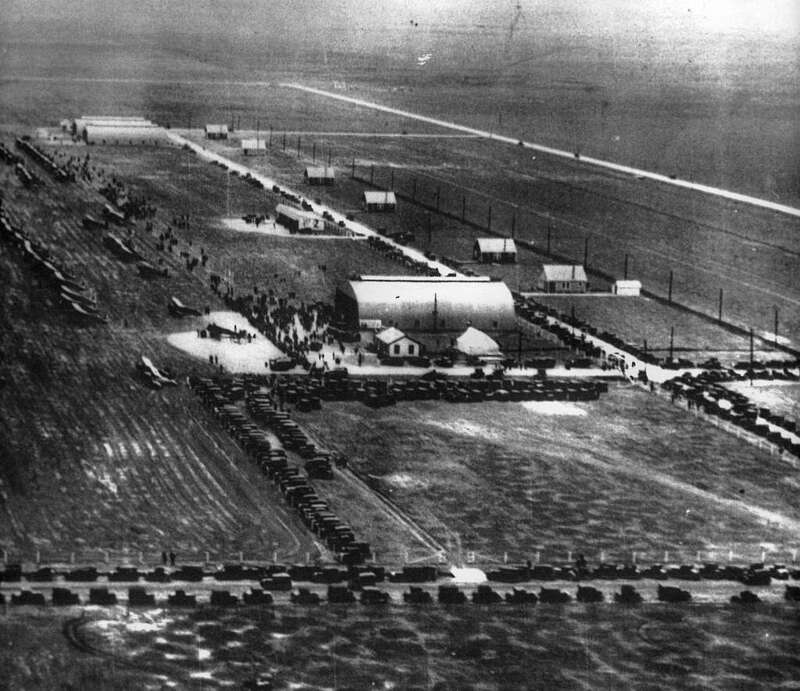 The site of William P. Hobby Airport in 1928. Courtesy of the 1940 Air Terminal Museum and the Houston Chronicle. Image available on the Internet and included in accordance with Title 17 U.S.C. Section 107. A Braniff Airways Plane in front of the William P. Hobby Airport Terminal. Courtesy of the 1940 Air Terminal Museum and the Houston Chronicle. Image available on the Internet and included in accordance with Title 17 U.S.C. Section 107. Aerial View of the opening day of the Air Terminal at Houston Municipal Airport, later named William P. Hobby Airport, in 1940. Courtesy of the 1940 Air Terminal Museum. Image available on the Internet and included in accordance with Title 17 U.S.C. Section 107. WILLIAM P. HOBBY AIRPORT. 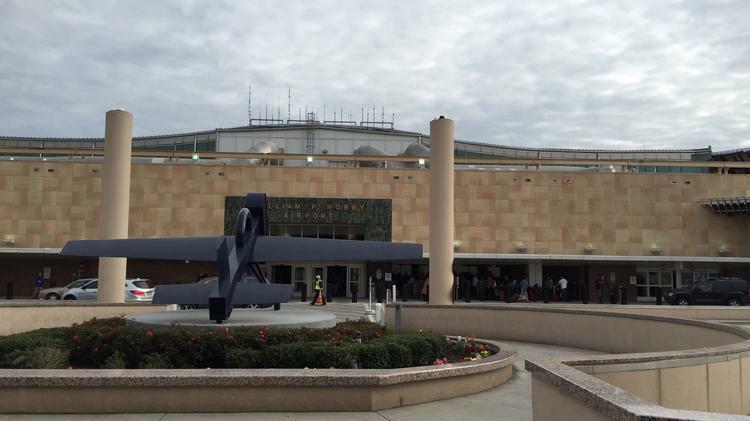 William P. Hobby Airport began in 1927 as a landing field in a 600-acre pasture. The city of Houston purchased the field in 1937 and expanded it to 1,240 acres. 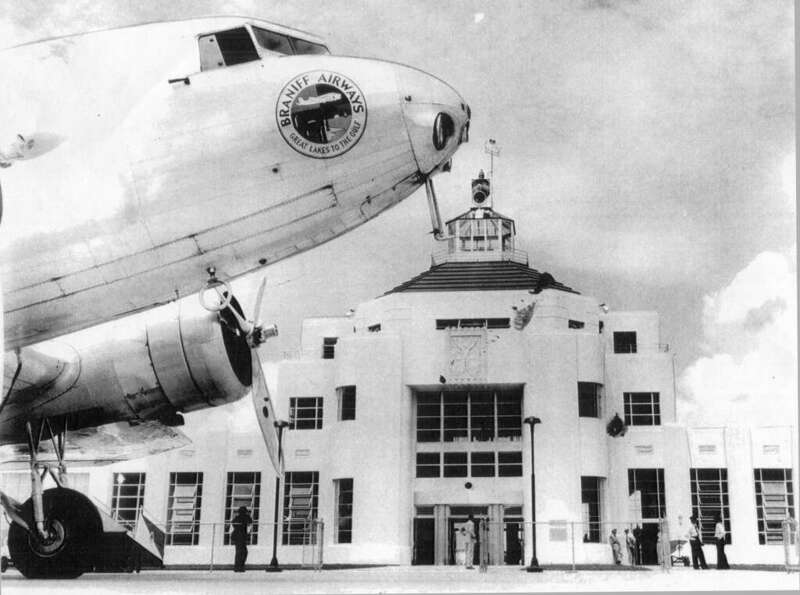 Its wooden terminal building was replaced at that time by a permanent structure built in Art Deco style. The Houston Municipal Airport, as it was then known, was served only by Braniff Airways and Eastern Airlines. During World War II it was a training site for the Women's Flying Training Detachment (see WOMEN’S AIRFORCE SERVICE PILOTS). By the end of the war the airport had paved runways, city-built hangars, and a lighting system, and four additional airlines had begun service. International flights became a reality by 1948, when Braniff included Houston on routes from Dallas to Central and South America. In 1950 Pan American Airlines began direct service from Houston to Mexico City. In 1954 the city renamed the airport Houston International Airport. In 1957 KLM Royal Dutch Airlines began direct flights between Houston and Amsterdam. The 1950s saw many additions and improvements made in keeping with the airport's international status, including expansion of the old terminal, construction of a new modern terminal, lengthened and strengthened runways capable of handling the new turbojet aircraft, several new hangars, and a high-intensity lighting system. In the 1960s growth continued with another addition to the terminal. In 1966 more than two million passengers passed through Houston International. The airport was renamed the William P. Hobby Airport in 1967 in honor of the Texas governor and Houston civic leader. Aerial View of the William P. Hobby Airport, circa 1950. Courtesy of the 1940 Air Terminal Museum. Image available on the Internet and included in accordance with Title 17 U.S.C. Section 107. Aerial View of the new central concourse at William P. Hobby Airport. Image available on the Internet and included in accordance with Title 17 U.S.C. Section 107. As early as the 1950s the then Civil Aeronautics Administration recommended that Houston begin to plan for another airport as, even at that time, Hobby was clearly inadequate for the new aviation travel market. There was inadequate parking, as well as crowded ticket-counter and boarding-gate space. By 1961 6,000 acres had been purchased north of downtown Houston, and construction of a new airport had begun. The new Houston Intercontinental Airport (now George Bush Intercontinental Airport) opened on June 8, 1969, and Hobby Airport was designated a General Aviation Airport serving mainly private and corporate aircraft, but by 1971 some domestic commercial carriers had returned to Hobby. By 1980 the Houston Aviation Department reported that ten domestic passenger carriers served more than three million passengers at Hobby Airport. There were also three cargo carriers operating out of Hobby, and 700 aircraft, including 175 jets, were based there. The International Terminal at the William P. Hobby Airport. Courtesy of Clark Construction. Image available on the Internet and included in accordance with Title 17 U.S.C. Section 107. Entrance to the William P. Hobby Airport. Image available on the Internet and included in accordance with Title 17 U.S.C. Section 107. 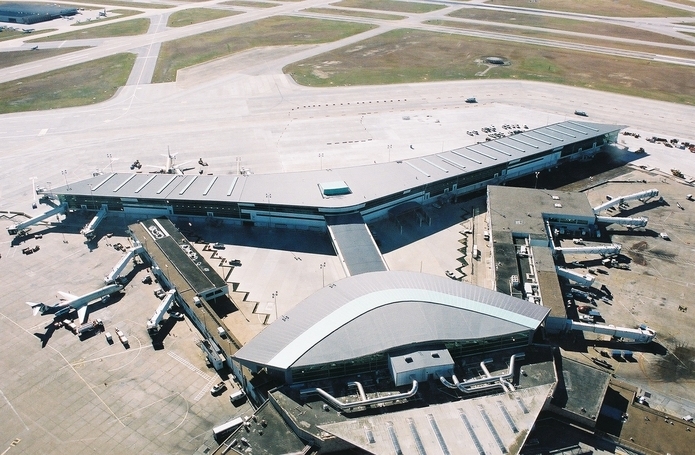 In 1998 the Houston Airport System began a long-term capital improvements project at Hobby that included an extensive renovation and expansion of the main terminal building, as well as a rehabilitation of the primary runways. Additionally, the three existing concourses were demolished to make way for a single, twenty-five gate central concourse capable of accommodating larger commercial aircraft. The first of these new gates opened in 2003, with the remainder complete by 2007. Rather than demolish the original 1940 Art Deco terminal building, which sat largely unused since the 1970s, the structure was renovated and reopened as the 1940 Air Terminal Museum in 2004. Construction of a new international terminal began in 2013 and lasted until October 2015. The $150 million project was financed almost entirely by Southwest Airlines, which operates the vast majority of the airport's domestic and international flights. In 2015 William P. Hobby Airport accommodated more than twelve million passengers, or about 20 percent of all passengers served by the Houston Airport System. Houston Post, July 7, 1986. Vertical Files, Dolph Briscoe Center for American History, University of Texas at Austin. Handbook of Texas Online, Art Leatherwood, "WILLIAM P. HOBBY AIRPORT," accessed April 25, 2019, http://www.tshaonline.org/handbook/online/articles/epwhe.